The scope displays the core to-do list of your plan. I.e. all the work items in your plan. In this section, you can create new issues, and add and view other associated information such as estimates, releases, etc. Epics - Large bodies of work comprised of multiple Stories. 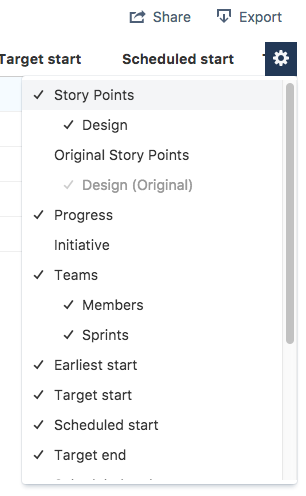 Stories - Small bodies of work that represent product requirement. Multiple stories can be used to make an Epic. Sub-task - Work components (i.e. tasks) that make up Stories. Story Points / Estimates (h) / Estimate (d) * Time estimate assigned to the issue. *Dependent on your chosen estimate type, you will see one of the three fields listed in the field column to the right. Field used to store your originally planned estimates. If the original estimate assigned to an issue is changed over time, use this field to gain a historical reference of the original estimate. *Dependent on your chosen estimate type, you will see one of the three fields listed in the field column to the right. The earliest start date refers to a user-specified date that is the earliest possible date an issue can be scheduled to start on. Click on the link below for further details on the earliest start date. This user-specified date guarantees that an issue will not be scheduled before a defined date, even if it has higher priority relative to other issues, or there are free resources available. E.g. If I set the earliest start date on an epic, how does it relate to the stories within it? Setting earliest start date on a parent issue: The earliest start date assigned to the parent (e.g. epic) applies to all stories within the epic. In the screenshot above, all the stories for epic "IOS-1 App Basics - iOS" will inherit the epic's earliest start date. Therefore, all the stories below the epic will only be scheduled by Portfolio from 17/Oct/2016 at the earliest. Setting earliest start date on a child issue where the parent already has an earliest start date set: Setting an earliest start date on a child issue (e.g. story) will overwrite any earliest start date set on its parent issue. In the screenshot above, story "IOS-3 Setup dev and build environment" has had an earliest start date set to 25/Nov/16. This differs from the earliest start date for its parent epic, "IOS-1 App Basics - iOS" - 17/Oct/16. Therefore, the Portfolio ignores "IOS-3 Setup dev and build environment" parent epic's earliest start date and instead uses its story-specific earliest start date of 25/Nov/16 when scheduling. All of the other stories within the parent epic haven't had specific earliest start dates set, so Portfolio will continue to use the parent epic's earliest start date of 17/Oct/16 for scheduling. In summary, the following are the earliest start dates set for each of the stories within the "IOS-1 App Basics - iOS" epic and used by Portfolio for scheduling. The date you’ve targeted to commence working on the issue. It has no impact on schedule calculation. The date you’ve targeted to conclude work on the issue. It has no impact on schedule calculation. Initiatives are groups of epics. Think of them as higher-level business priorities or big projects potentially spanning multiple teams. Labels are keywords or tags that you can add to your tickets to categorize. コンポーネント Components are sub-sections of a project. They are used to group issues within a project into smaller parts. Portfolio considers an issue "Completed" when it is assigned to any status of the "Done" category. For example, green category. Progress Issue progress bar. Learn more about tracking progress and status here. ソース Source where the issues were pulled in from.